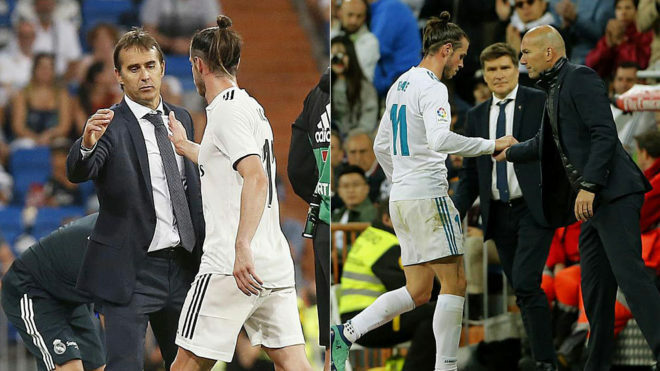 On the verge of leaving Real Madrid before Zinedine Zidane was replaced by Julen Lopetegui, Gareth Bale didn’t really want to get into the debate about who was the better coach. The Welshman has started the 2018/19 LaLiga Santander campaign in fine form, and looks back to somewhere approaching his best, and the fact he can speak to Lopetegui in English means communication is much easier. “Obviously, it helps, I can speak in Spanish, but maybe I won’t need to go into the amount of detail I normally would,” he said to the Daily Mail. With Cristiano Ronaldo now gone, Bale identified how things are a little more relaxed without the Portuguese’s presence in the dressing room. “Obviously, it’s going to be a little different, it’s going to be a little more relaxed,” he continued. Ronaldo‘s goal against Juventus is in the running for one of the best of last season, whilst Bale‘s stunner didn’t even make the top ten. That angered him, as did his initial omission from the Champions League final in Kiev. “I was angry, very angry, to be honest,” he added. “I felt I deserved to start the game, I had been scoring goals, so it was hard to let go of the anger, and my anger prepared me for that goal. “If you don’t try things, they never happen, and I knew exactly where the ball was going. “You can see in the video that my head is spinning to see exactly where it went. “When I hit the ball, I knew it was a good shot. Finally, the Welshman refused to rule out a return to the Premier League. “You always want to come back and play in your home league and a part of you will always miss home,” he noted.